Depending on which research you read and believe, or food historian you listen to, it is said that Marmalade has its roots in Dundee. Though there is a nasty rumour that it was invented in, and I can hardly bear to bring myself to type this, in England! Nonsense! Dundee is the home of marmalade - a'bidy kens that! Janet Keiller made it first in her kitchen. It wisnae Henry the VIII who loved the marmelos preserve that he imported from Portugal nor his 17th Century cooks who adapted the recipe using their own citrus fruit to help aid digestion. Janet's husband had a shipment of oranges in the harbour and she decided to preserve them by making a spreadable treat. It was so popular that the Keiller family began selling it from 1797. Some argue that though they did not invent marmalade, they were the first to mass produce and sell it commercially and that Scots were the first to eat it for breakfast. There is also the Countess of Sutherland to consider. There is historical evidence of her orange marmalade recipe that goes back to 1683. Miss Minto's Treacle Marmalade has recently proved that Scots make the best conserve as Shona Leckie, a retired biology head teacher, won the Best in Show at the World Marmalade Awards, just south of the border in Cumbria. She used her family recipe, handed down from generation of generation of Scottish hame-cooks using the best of Seville oranges. Her jeelie was so tasty that London's Fortnum & Mason are now selling jars of it to their discerning customers, with donations from each jar being given to the landmine clearing charity, the Halo Trust. 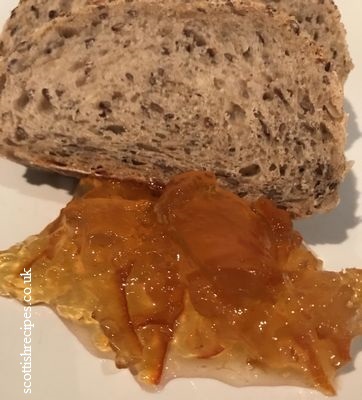 Patrick kindly told us via Facebook that another idea of the origins of marmalade is that this orange confection was created for Mary Queen of Scots who was often ill (or malade in French). Thus 'Marie malade' or further, that it was her ladies in waiting's take on a preserved fruit tradition that came from the Levant called a mermelata.